You all are a bunch of enablers. I've been on the fence about trying another IMP and this thread sealed the deal. I owned a couple, maybe a dozen years ago, and didn't like the constricted draw. They were both full bent pipes and one wouldn't pass a pipe cleaner at all, had gurgle issues with them. To be fair, I was fairly new to pipe smoking then and perhaps I was too quick to get rid of them. From what I'm hearing they are much improved now, so I ordered a short straight pipe (pic below) and will give them another shot. That's what we're here for. That's an interesting one never saw a nosewarmer imp. What i have found with imp sometimes there is a bit of glue in the stem that causes a don't restriction. A good scrubbing with a bristle cleaner usually knocks it out.i have had that with a couple brands that have the fixed tenon. As for a bend one not passing a cleaner what I've found helps is when it gets to where it stops if i turn the stem 90° then you can feed it the rest of the way through. 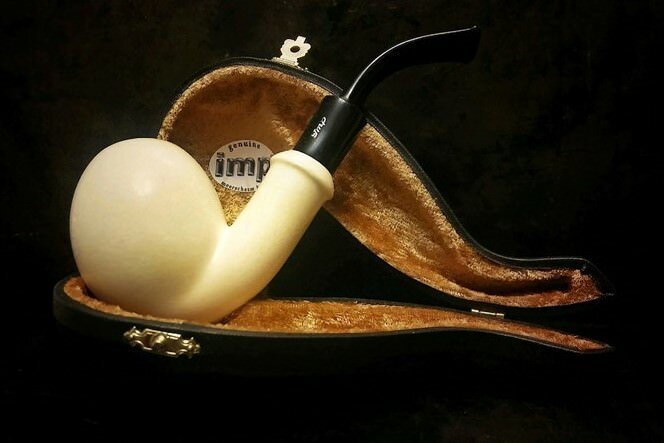 I have four meerschaum pipes. 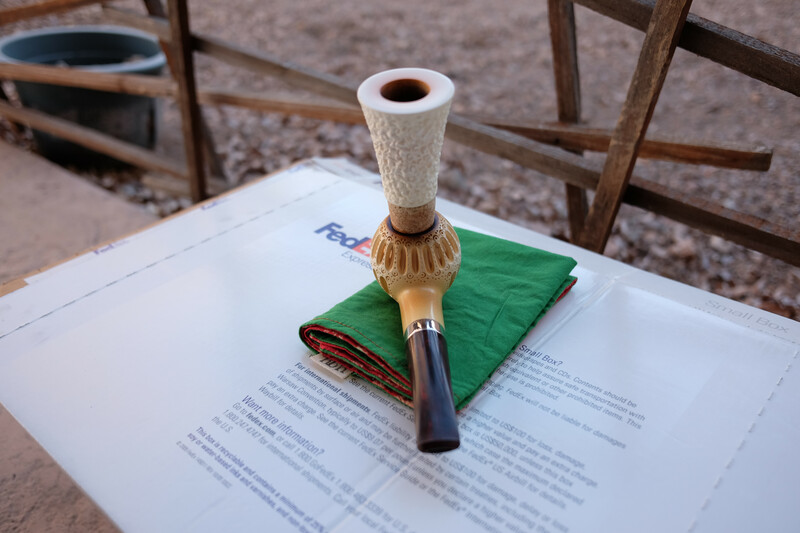 2 IMP's an SMS and a meerschaum Depot. The IMP's are by far the better pipes. The stem work is way better then the other two. But they are big. I don't often have time to dedicate to that long of a smoke. I wish IMP would make more traditional shapes and somewhat smaller pipes. 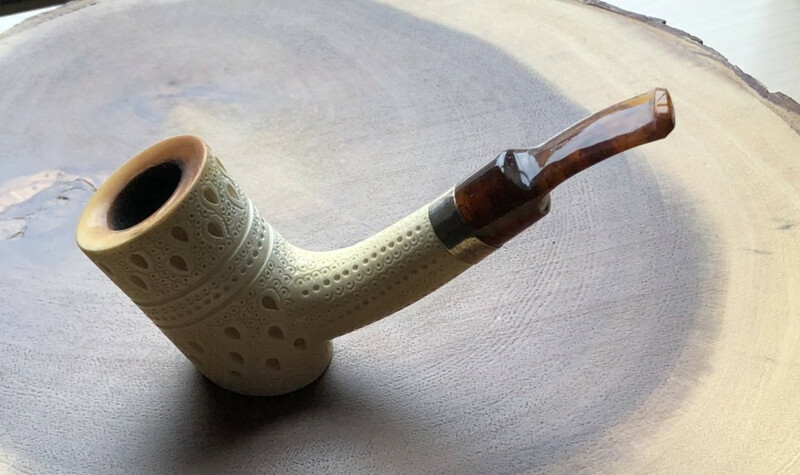 The SMS is not a bad pipe but the stem is lacking, the meerschaum depot you can have, I have never heard a meerschaum that gurgles but I own one. Great score, love the plateau rim on that one! Haven’t posted since the migration (mainly a lurker at the old forum, anyway). But I picked up this IMP RC earlier this week and haven’t picked up another pipe since. Smokes like a dream. I grabbed this at last year's NY Pipe Show, in Newark. I'm a sucker for a silver mount. Here is a pic of the only IMP I own. I think it smokes ok, not as good as my artisan made pipes as those smoke cooler and have much nicer stems. I believe it's a "coloring bowl." Not that I have ever understood the purpose of "coloring bowls"
That's cool - smoking a Baki and IMP at the same time! I like the little heel on this guy. And it appears to sit! Really thinking about an IMP now (especially after my quasi-rant on Altinay), really like how so many of them are equipped with silver bands. Not to high jack this thread too much but do all IMPs use a briar-style tenon system? Anyone have problems with that type of tenon system? That is an awesome pipe! !